Jamie Glenn/Daily Mining Gazette Superior National Bank-Stanton’s Tyler LaDuron connects with a pitch from REL Inc.-Mohawk Technologies’ Grant Johnson during a playoff game Tuesday at the Hancock Driving Park. HANCOCK — Full bleachers and high hopes filled the air at Hancock Driving Park last night for the opening game of a best-of-three semifinal series that featured Superior National Bank-Stanton, who entered the series with a regular season record of 10-4, and REL Inc.-Mohawk Technologies. Despite a valiant effort, hosts REL Inc. couldn’t recover from the heat that SNB-Stanton brought early on in the game which carried them to a 9-4 victory. The first inning saw a quick run of the bases for SNB-Stanton player-manager Daron Durocher, and that was only the beginning for the Durocher family. Daron’s nephew Dax Durocher would continue the streak by adding a hit in the second inning, Daron would later bring in one more run in the sixth inning of the game for SNB-Stanton. In the third, SNB-Stanton capitalized on errors from REL Inc. by adding four runs coming from Justin Kirby, Tyler LaDuron, Erik Nettell and Luoma. Looking to add to that 6-0 lead just an inning later, Al Nettell and Trent Keteri scored runs, making it an 8-0 advantage for the visitors. SNB-Stanton was aggressive with their swings and that really cost REL Inc. as they took advantage of every mistake REL Inc. made along the way. 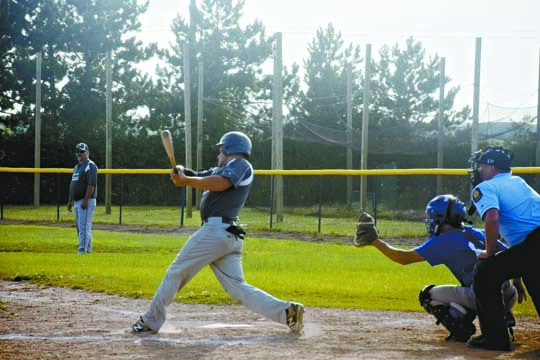 “They came out hitting the ball,” said REL Inc. player-manager Tyler Loukus. “They hit the ball well. A series of errors from REL Inc. did not help things either. While Grant Johnson started on the mound for REL Inc., he only lasted into the fourth inning before giving way to Sam Karinen, who took over after playing third. The hosts were able to respond with a run from Brent Loukus in the fourth and another from Ross Kinnunen at the end of the fifth inning, leaving REL Inc. trailing 8-2. Down again by seven, 9-2 in the seventh, REL Inc. struck twice more as Rori Anderson and Grant Johnson both crossed the plate, but it wasn’t enough to catch up to SNB-Stanton. Coming out with the first win puts SNB-Stanton in a comfortable place going into Thursday’s contest. REL Inc. and SNB-Stanton will meet at again Thursday at Stanton Field at 6:30pm for Game Two.